The Servers is a gospel bluegrass group based in Villa Rica, in West Central GA. The group was formed in 1999 by Kelly McCord. Kelly had been a member of a group called The Gospel Servers which began in 1993 and dissolved in 1998. The group now has 5 members, Kelly on guitar, Brandon on banjo, Amos on bass, Johnny on fiddle and Galen on mandolin. The Servers were inactive for a one year period and began performing again in April, 08. We released a new CD called “The Journey” in June 2018. Please check our schedule and we hope to see you soon. The Servers perform traditional bluegrass gospel music, bluegrass with a southern gospel flavor and and occasional acapella number. Our central focus is spreading His Word in music. We sing almost exclusively in churches and traditional Christ-centered gatherings. Hope to see you soon! My name is Kelly McCord and I have lived in the West Georgia town of Villa Rica, Georgia (Carroll County) all of my life. Villa Rica is about 35 miles west of Atlanta, Ga.
My wife, Patricia and I were married on January 29, 1992, and have one son, Josh McCord and his wife Crystal. We have two grandsons – Bailey & Zachery. I was saved at Fullerville Baptist Church on May 17, 1988. I started going to church there when I was 5 or 6 years of age when the Church Bus would come by and pick my Mother, me and my brothers and sisters up. I remain a member of Fullerville Baptist Church and serve as a deacon. I grew up singing in Church. My childhood memories are sitting around the piano at my grandmother’s house with my brothers and sisters singing while she played old hymns, country and whatever came to her mind. We could all harmonize. I really enjoy singing & playing music and hope that our music helps people along the way. I feel that this music is a ministry – sharing My Lord through song – and thank The Lord for allowing me to be a part of it. The Lord has blessed my family greatly allowing me to have a family run heating and air business – McCord HVAC Inc. also operating out in the West Georgia Area since 1996. I would like to thank all the Churches who invite us to sing and all of our supporters. I was born in the middle of March 1982 to Linda and Tony Fennell. I grew up in a little community called Yorkville which is in between Dallas and Rockmart, GA. Music has always been a big part of my life. I started at an early age playing drums for a southern gospel group that my parents played for. My mom played piano and my dad played the bass. My dad taught me a few notes and I was off. I spent a lot of time on the piano bench next to my mom trying my best to play for our church. In 2000, I started playing the upright bass with the Jordan River Band. 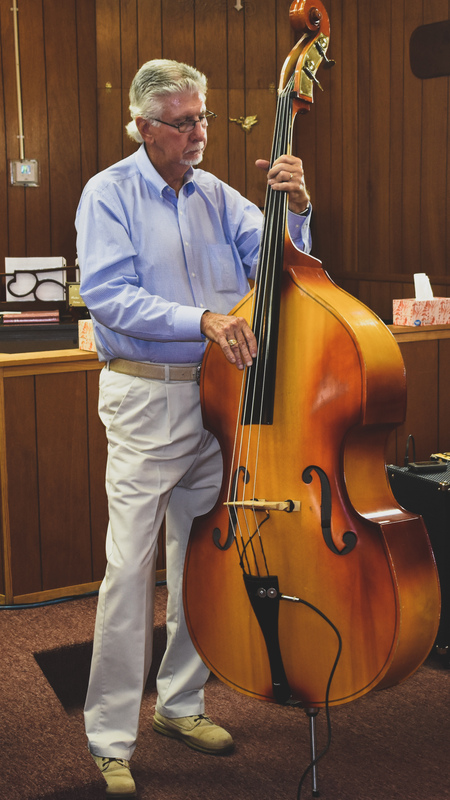 They took a chance on me even though I had never even touched an upright bass before much less played one. Through a lot of practice and a lot of encouragement they helped me learn how to be a bluegrass bass player. Since then I have played with a lot of groups but I enjoy playing bluegrass gospel music the most. In the fall of 2012, I was asked to join The Servers. I played the bass for four years until Tiny, our banjo player, was diagnosed with cancer. Tiny spent a lot of time teaching me as much as he could about being a banjo picker until he wasn’t able to travel anymore. I have my good and bad days picking but one thing Tiny taught me was to never give up, just keep the banjo in my hands more. I thank God for allowing me to carry the message of Jesus Christ in song, the talent he gave me, and for putting me with a great group of guys to play with. I’m thankful to have a good Christian home and God-fearing parents but mostly, I want to thank God for that Tuesday night I accepted Christ as my savior. I can’t tell you the date or even the year but I’m thankful that I can still go back to the place it happened. Johnny was born September 29th, 1966 in Lineville, AL to J.T. and Martha Watts. He began his love for music at an early age and began playing the fiddle at only 3 1/2 years old. 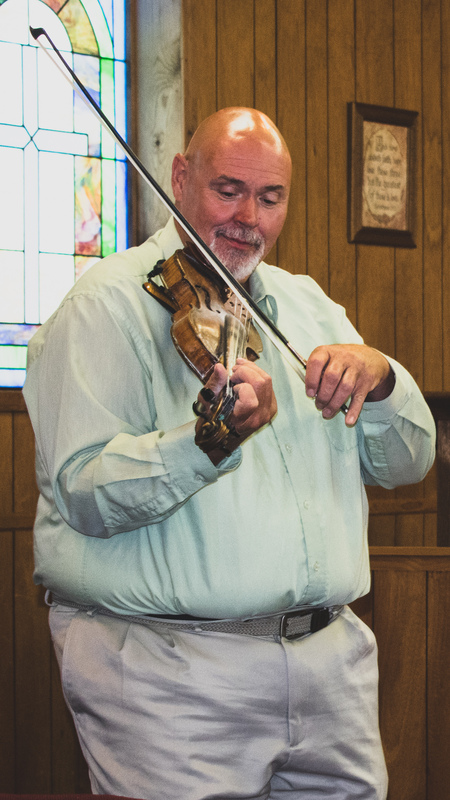 In his younger years, he competed in several fiddle contest all over the Southeast placing as high as 3rd at the Grand Master Fiddler Championship in Nashville, TN. In 2014, Johnny began playing with The Servers. He is very thankful for this opportunity to spread the word of Christ through music. Galen was born in Georgia on December 1, 1968, to the parents of Riley L. and Shirley D. Barrow. He is the youngest of six children, three boys, and three girls. 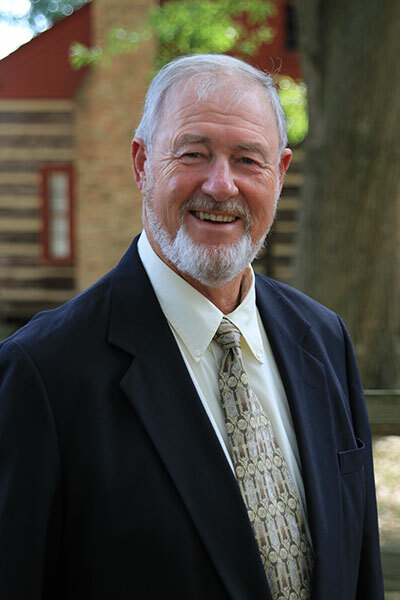 Galen grew up in the small community of Buncombe, located in Haralson County. His early hobbies included playing different sports games with family and friends and going quail hunting with his daddy. 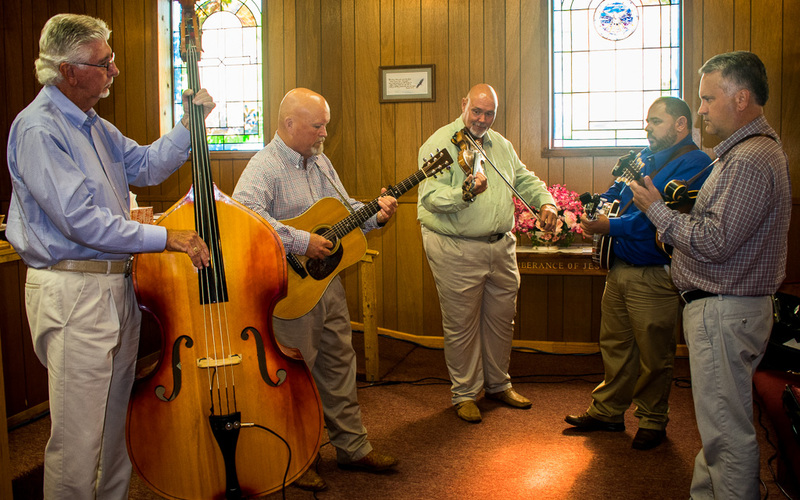 Throughout the years Galen has participated in a number of traditional and not so traditional bluegrass groups. Among these are Solid Ground, 4 Winds West and Standard Deviation. Playing in these groups provided great memories and hours of enjoyment. 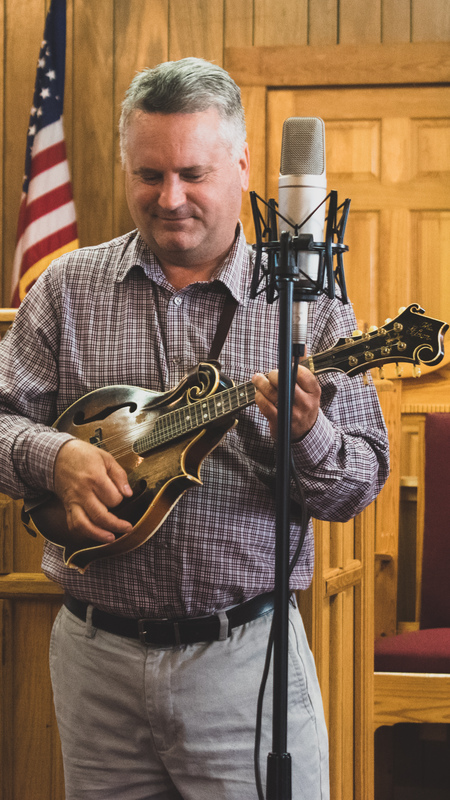 In 1997, at a local music barn near his home, Galen met Kelly McCord who fronted his own bluegrass gospel group called the Gospel Servers. Kelly’s group needed a mandolin player and so Kelly asked Galen. Although he was playing with 4 Winds West at the time, Galen said he would fill in until someone else could take his place. Little did he know that six years later he would still be with playing in Kelly’s group. 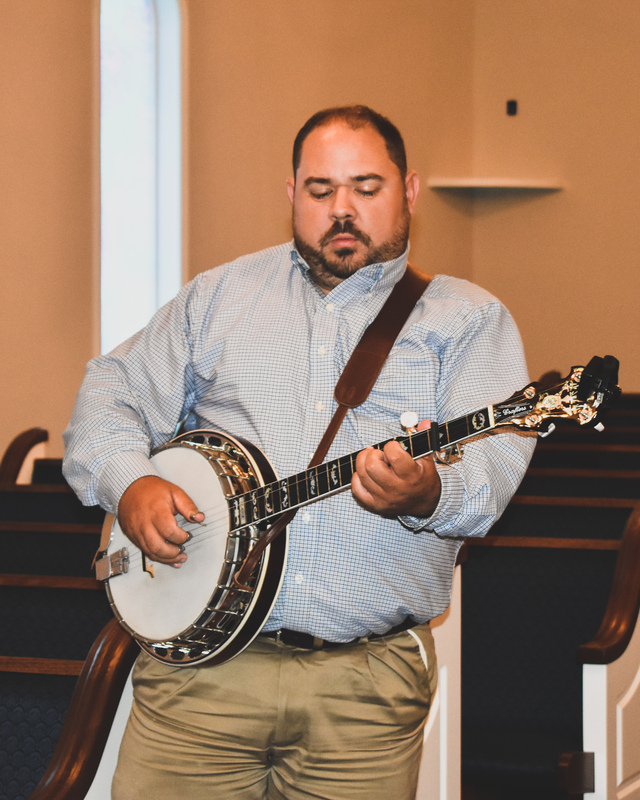 In September 2001, while singing with The Servers at Macedonia Baptist Church in Pea Ridge, Alabama, Galen met the lady that would become his wife, Melissa Scott. Melissa is a beautiful woman with a heart of gold that plays piano and sings like an angel. However, dating between the two did not start immediately. It wasn’t until March 9th, 2002 that Galen and Melissa actually went on a first date. After a whirlwind romance, the two were engaged on July 9th, 2002, and married on November 9th, 2002. Sixteen years later, Galen and Melissa have produced one CD called “Back Home with Galen and Melissa”, a son, Ethan, born on February 9th, 2006, and a daughter, Audrey, born February 17th, 2010. 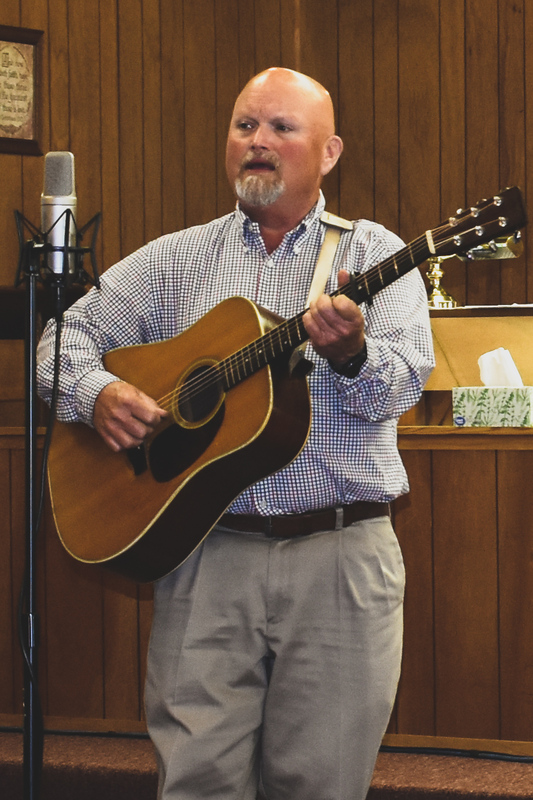 Galen’s plans for the foreseeable future include continuing to work for the Georgia Department of Transportation where he hopes to retire in a few years; singing with The Servers all over West Georgia, East Alabama and wherever else the Lord allows them to go; and singing with his family as the opportunity arises. Galen hopes for The Servers is that the group will one day branch out more and sing over a larger area. He would like to see the group expand into other states. As Galen says, “it’s always great to see old friends you’ve sang for many times over the years, but it’s great to meet new people and make new friends who will one day become old friends too”. Amos “Moose” Wilder was born on December 20th, 1945. He was born and raised in Carrollton, GA. In 1964, he graduated from Carrollton High School. Amos is married to Teressa Wilder. He has three daughters, Kelli, Ashley, and Nicole. He retired from Georgia Power after 41 years. Amos began playing music in 1962. He started the Wilder Family Southern Gospel Group in 1985. In 2000, he joined The Servers. Kelly McCord and The Servers are the best group of men he’s ever been associated with and it is an honor for him to play with them. Hi, Yall. I’m Tiny Morris and I was raised in Pea Ridge Alabama a small community about 30 miles south of Birmingham, starting some 60 years ago. I married Linda Goodwin in 1967 and we have two children, one boy and one girl and they each have a boy and a girl. I was saved in 1966 and I now attend Hillcrest Baptist Church in Acworth Georgia. I suppose you wonder where I got the name “Tiny”, well it was on my 3rd shift at work with the Cobb County Fire Dept. and it must have fit because it stuck. I began banjo lessons in January 1975 from Bill Blaylock at North Georgia Music which I continued for 3 months. My passion is playing and singing Bluegrass Gospel and I was blessed to be asked by the Servers to play with them in 2000. I’ve had a wonderful time and met so many great people. Thanks for the memories so far. Finally, I would like to thank my mother, who played piano by ear at the little country church where I grew up, for her love and her prayerful support. She was truly a prayer warrior for the faith. And for my dad for his strong christian example and his simple wisdom. Dad played guitar and they sang the old gospel songs of which their favorite was “Jesus Forgives And Forgets”. They went to be with the lord in the early 90’s. And I thank you Jesus for your saving grace.